Islands. They flower from mid spring to mid summer and the joy of gardenias is a toss -up between the soft velvety petals and the magnificent scent. I think the scent wins me over every time. According to the internet, the petals are edible and taste a little like they smell. I tried them ... and survived. I think the older yellow petals would be a surprising addition to a summer salad - give it a go. Thanks V/President Sue. Webmaster's Note: If you would like to know more about growing Gardenia and the many varieties available please visit plantmark.com.au for an excellent fact sheet. Gardenia are dead easy to propagate too. For the Spring Garden Competition Presentation Night a few years ago we cut a lot of my gardenia for the floral displays as the leaves were so shiny and a lovely addition to the vases. Jeannine Y used these as cuttings and successfully grew enough of them to create a lovely hedge in their beautiful garden. Plants that are grown from a cutting are the same as the plant they were taken from and are literally clones of the original plant. 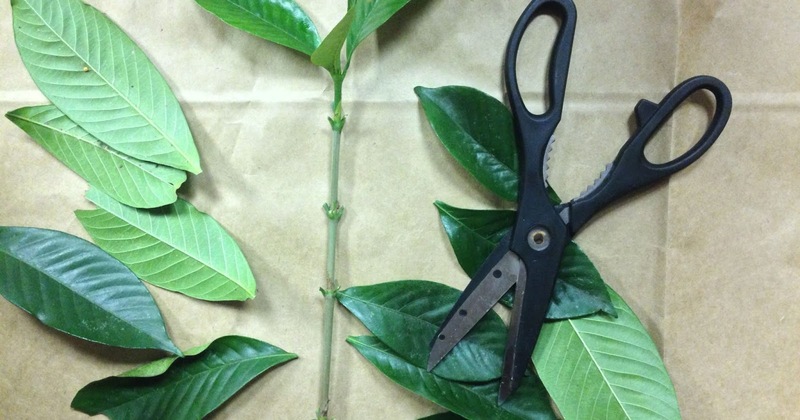 Pruning and taking gardenia cuttings go hand in hand. Start off with a cutting which is at least 15cm long and taken from the tip of the branch (which is basically what you usually prune off after flowering anyway). Remove all the leaves except for the top two sets.The part of the stem that forms new roots and shoots is called a node. These growing points produce leaves, flowers or shoots when the plant is growing normally but, if these nodes are planted they are the growth points for roots. Dip in rooting hormone (this encourages encourages the growth of roots) and place in a peat/sand mix, and multiple cuttings may be placed in each pot. Place your pot(s) in bright, but not direct sun and the ideal temperature would be around 24C. It is essential that your propagating mix is kept moist but not sodden and it is imperative for gardenia to have high humidity however, for us here on the Coffs Coast that comes quite naturally! You should expect your gardenia to have taken root within 6-8 weeks.